The 2019 Boat Show season is upon us! This is your opportunity to snag a fantastic deal on a new MasterCraft for this coming summer. If you want the best possible pricing along with the best possible selection then this is your last chance before the summer rush. Not only will you save thousands off of summer pricing but your new boat will be ready for the water the moment the weather breaks. For those that don’t want to fight the crowds or pay crazy admission pricing this is your answer! Join us on Friday, January 11th or Saturday, January 12th from 12pm until 8pm at our Cincinnati location. Our showroom is packed with the latest MasterCrafts and wall-to-wall gear. Not only will you get first dibs on the proshop sale items but you’ll enjoy free food, free beverages, free parking, no crowds and better than boat show pricing! This is correct… you will get better than the show prices on these two nights only! Why Come to the Pre-Boat Show Sales Event? If you’re looking for a deal then this is your opportunity. Pricing is slashed on all remaining 2018s in stock. Take delivery now and spend the rest of the summer soaking up the sun in a brand new MasterCraft. Check out our remaining 2018 stock on our Inventory page for applicable models. You’ll save THOUSANDS from normal summer pricing. Boat shows may be over but that doesn’t mean you completely missed out on all the great deals. You’ve got one more opportunity! Join us for our spring open house on March 24th in Louisville or March 31st in Cincinnati from 10am – 6pm. We’ll have food, prizes, proshop specials and great deals on all new MasterCrafts. With the MasterCraft Winter Sales event expiring on March 31st, this will be your last chance to save thousands on a new MasterCraft for summer. We’re carrying some of the remaining boat show pricing over… which means you could save thousands on your new boat. But hurry, because after March 31st these prices are officially relinquished. With over 30 new MasterCrafts in stock we have several models to still choose from. As the spring weather starts to warm up boats begin to roll out the door and our overall selection starts to dwindle. Lock in the model and colors of your choice now! We’ll have some grub to munch on and drinks to keep you hydrated. Each attendee gets an opportunity to play Plinko where you can win t-shirts, gift cards and more! Want a deal on some proshop gear? This is your jam… For every $100 you spend you’ll get $25 in Current Cash to be used at a later date. These are redeemable coupons good toward future purchases! Check-in on Facebook while you’re here and you can enter our surf board giveaway. Every person who attends will be entered to win a free surf board. Winner will be announced on Facebook on April 4th. Mark your calendar and share with your friends! If you didn’t seal the deal at the boat show and are still considering a new boat you don’t want to miss this opportunity. Join us Wednesday, March 29th at either location. We are keeping the doors open until 9PM, buying some pizza and serving the drinks! Come climb through every possible model and set your crew up for the best summer ever. This is your last chance to take advantage of MasterCraft’s Winter Sales Event and save thousands off normal summer pricing! Why: Free pizza, free cold beverages and boats. You’ll also save thousands on any new MasterCraft. The MasterCraft Winter Sales Event expires on March 31st. Smarter buyers order early. It’s simple: first come, first serve. Design your 2016 MasterCraft today and get your custom dream boat delivered by spring. When you shop in the spring you’re choosing from our existing selection. When you order now you get every color and option exactly the way you want across every model. Every model we offer is priced at its lowest in the fall. So take advantage and get better-than-boat-show pricing on your 2016 when you order now. You’ll save up to $7,000 on every model when ordering this time of year. When you trade in early, you’re ahead of the curve and we’re eager to top off our selection of used MasterCraft boats-so you get top dollar. Don’t wait until we already have a lot full of trade-ins. Upgrade to a 2016 this fall to maximize your value. MasterCare is the industry’s best warranty and it comes with every MasterCraft. Five years, full coverage, no catches, no extra fees and factory direct. Entire first year of maintenance is included on every new 2016 model purchased. Our service after the sale is where we really shine. You won’t find another dealer that offers the level of service and support that we provide. Check out our customer feedback on facebook or read some of our customer testimonials to see why we are anything but your typical dealer. 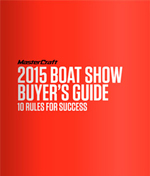 The 2015 boat show season is here! This is your chance to grab the absolute best deal on a MasterCraft for summer of 2015 and join the family of stoked MasterCraft owners. As the shows kick off we’ve outlined ten rules for success when buying a boat to help you come prepared. Whether you’re a tow sports veteran deep in the research process, or just dipping a toe in—this guide will give you everything buyers need to know. Friday January 16th marks the beginning of the 2015 Cincinnati Boat Show. This is a great way to get the family out of the house and check out all the new stuff MasterCraft has to offer for 2015. We will have a new 2015 X-STAR, X46, X30, X23 and NXT on display. In addition to showcasing the new changes for the 2015 product line we will be hosting a customer appreciation after-party on Saturday night, January 17th, at the Betty Bar from 9:30pm – 12:00am. The after-party is a short walk across the street from the convention center and a great chance to hang out with other watersports enthusiasts in a relaxed atmosphere. So grab your boating buddies and come help us celebrate a great 2014 as we start the countdown until summer. The 2015 Louisville Boat Show kicks off Wednesday, January 21st. Grab the family and come check out all the new stuff MasterCraft has to offer for 2015. We will have a new 2015 X25, X46, X30, X23 and NXT on display. Fall is the absolute best time to buy every MasterCraft–from the all-new X20 to the blazing hot NXT. Whether you’re starting out or trading up, you can take advantage of factory production cycles to get the new custom boat you’ve dreamed about at the lowest pricing we offer all year and guaranteed early delivery this spring. Design your 2015 before November 21st, skip the winter garage game and start planning your summer on the water. You order smarter when you order now. Beat the boat show rush–and its pricing–to make the offseason work for you. Design your MasterCraft now for guaranteed delivery by spring. Don’t compromise on your dream boat–make sure you get every option you want and the colors you’re imagining. When you order in the fall your boat is customized exactly the way you want it. Every model we offer is priced at its lowest in the fall. This is the only time you can take advantage of factory production cycles to get better-than-boat-show deals. Lock in your 2015 at its best price. You’ll save up to $7,000 on every model when ordering this time of year. There’s a reason why used MasterCraft boats get snapped up quickly. They hold their value better and dealers welcome them. Take the opportunity to trade up now to maximize your value and get an all-new 2015 with our exclusive Gen 2 surf system–the only way to shape the wave exactly the way you want it. Trade in your current boat this year before your boat is a model year older next spring. This means we pick up the tab on storing your trade and getting it winterized. Entire first year of maintenance is included on every new 2015 model purchased. Our service after the sale is where we really shine. You won’t find another dealer that offers the level of service and support that we provide. Just ask him, her, him, or any of them why we are anything but your typical dealer. GET YOURS FIRST: Anticipated production demand is high. Those who wait until winter boat shows to purchase risk pushing out delivery dates into early summer. Ordering in fall guarantees first round delivery in spring 2014. DON’T COMPROMISE YOUR DREAM: Get every option you want in your choice of colors. Typically we pre-order inventory and spec it with the most popular options. By placing an order in the fall, your boat is 100% custom built for you. GET AN UNBEATABLE DEAL: Fall orders receive the best price on the best boat on the water. Every available factory discount means you get ‘early access’ to boat show pricing. You’ll save up to $7,000 on fall orders! MASTERCARE IS STANDARD: The industry’s best warranty is included on all 2014 models. Five years, no fears, factory direct coverage. TOP TRADE VALUES: Trade in this year before your boat is a model year older next spring. Plus we cover the winterization and storage! FREE STORAGE: We’ll keep your new boat under roof until spring delivery. ONE YEAR ON US: Entire first year of maintenance is included on every new boat purchased. The ULTIMATE EXPERIENCE: Our service after the sale is where we really shine. Just ask him, her, him, or any of them why we are anything but your typical dealer. Up to $6000 off 2013 models. Applies to stock and ordered models taken or ordered before December 15th. This is the absolute best time of the year to get into a new MasterCraft. With plenty of boating weather remaining you can take delivery of a new boat and we’ll cover the winterization and storage. This along with the fall factory incentives means you won’t find better time to buy. For remaining 2012 models and incoming 2013 models please view our inventory. For more details or questions call us at 859.525.9253. If you haven’t heard of the new 2012 X-30 then you don’t know what you’ve been missing. Check out the video below to see what this new boat is all about. Our first X-30 is arriving next week and is already sold. But don’t sweat – we have another arriving around early May that is up for grabs. We are an award winning MasterCraft boat dealer with locations in Cincinnati, OH & Louisville, KY - providing unmatched service and sales throughout OH, KY & TN. We specialize in the sale and service of MasterCraft wakeboard and ski boats. Come find out why we are are unlike any marine dealer you've ever dealt with — delivering the ultimate ownership experience. © 2019 Current Watersports MasterCraft Boat Dealer in Cincinnati, OH and Louisville, KY. © 2016. All Rights Reserved.